In between putting our house on the market and cleaning and going through closets and drawers and moving kids to and from college and into new apartments, I have continued to cook and bake and can. I find working in the kitchen to be relaxing and fulfilling and a way to be creative. Except for the dirty pots and pans and dishes part. That part I do not like at all. These are the things that I canned this year. 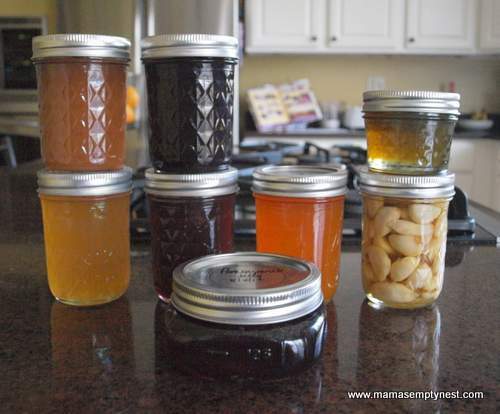 The thing about canning and preserving is that it requires patience. I am not a very patient person so preparing jams and jellies and pickling stuff is a good lesson in learning patience for me. Apple Butter – My friend, Cathy, has an apple tree in her yard that produced a bumper crop of apples this year. My friend, Laura, and I got together and made apple butter. It was my first time making apple butter, and it was yummy. My brother-in-law LOVED it and ate an entire jar himself. Peach Jam – My family LOVES peaches. I do not. My youngest daughter bought a large volume of peaches from the local farmer’s market and then went back to school. I turned the ripe produce into jam which everyone loves especially my brother-in-law who ate an entire jar himself. Blackberry Jam – I made a batch of this early in the summer when the fruit was on sale, and I made another batch recently when another supply of blackberries from Mexico went on sale. 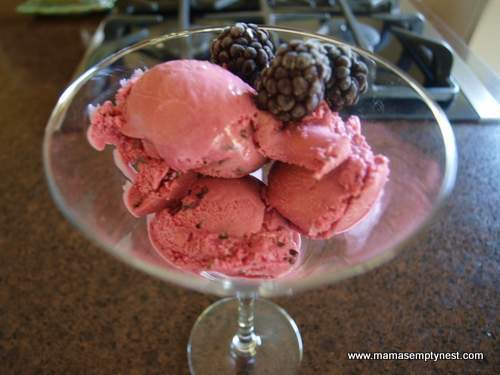 Then I got out the ice cream maker, which I had put away until next summer, and made a batch of blackberry chip ice cream. I just could not help myself. Raspberry Jam and Jalapeño Jelly – I made my normal batches of these when raspberries were in season and my jalapeño peppers were ripe. My brother-in-law did not eat any of the raspberry jam because this is my sister’s favorite. Pickled Garlic – I buy whole garlic in bulk from our local warehouse store because it is cheaper to buy it in bulk even if I can’t use it all before it dries out than it is to buy it from the grocery store. I do use a lot of garlic, but I hate to waste food, and I saw a recipe for pickled garlic so I made some. You can use it in lieu of fresh or just eat it right out of the jar. Pomegranate Jelly & Apple Habañero Jelly – These were my two new jellies this year. I wanted to try making jelly from juice so I made the pomegranate jelly and put it into funny, squat jars. I had apple cider left over from Thanksgiving and saw a recipe that used apple cider to make Apple Habañero Jelly. This is so, so good – just the right amount of sweet and heat. Our oldest daughter and her husband live in Tucson, Arizona, and will be visiting over the holidays. They asked that we not buy them anything – they would rather get together for a nice meal with everyone, and they really do not want to deal with shipping stuff and feel that they have everything they want anyway. So, I sent them a package of each of my canned goods that I made this year. In return, they are shipping us some of the homemade tamales that they made with some friends in Tucson. I consider this a win-win! 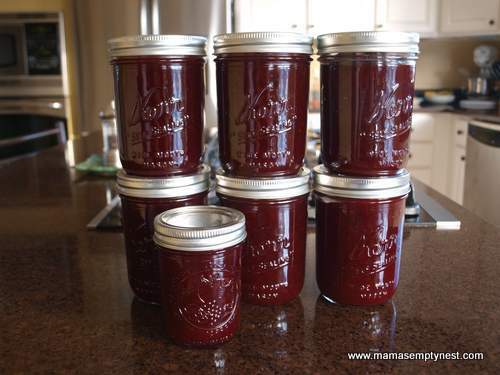 I started making homemade cranberry sauce last year. It is so easy to make and so much better than the stuff in the can. I make a spiced version and a plain version, and I make enough to share. 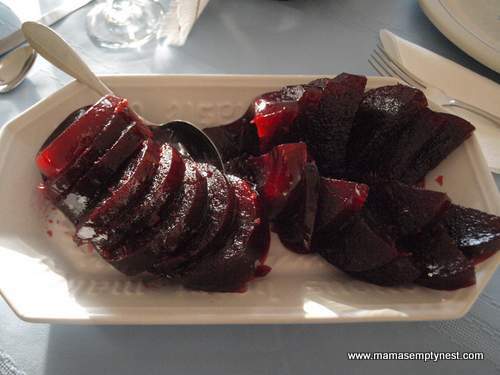 My homemade cranberry sauce – one spiced and one not – isn’t it pretty on the plate? 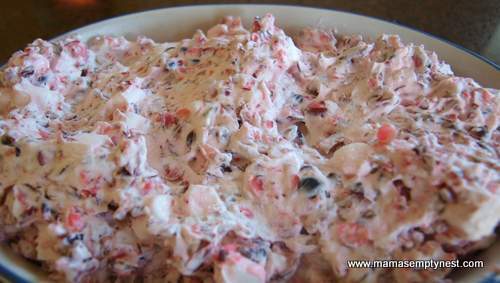 One of my favorite new cranberry recipes from last year was Cranberry Salad. This is a new regular addition to our holiday table. Nantucket Cranberry Pie – I made this in a quiche pan because I thought the red cranberries would be pretty against the white dish. I also used an entire 12-ounce bag (about 3 cups of cranberries) because the recipe calls for 2 heaping cups and that is just not enough. 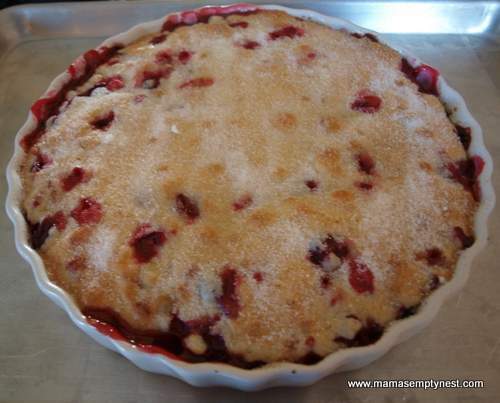 Think cranberry cobbler – easy to make and so good to eat! Nantucket Cranberry Pie is my new favorite recipe. I printed this off in 2010 to make when we went to my sister-in-law’s home for Thanksgiving. But she doesn’t like cranberries so I made an apple pie instead. I made the cranberry salad as my new cranberry dish last year and didn’t think I could get away with three cranberry items on my Thanksgiving table. So, I made the Nantucket Cranberry Pie this year for the first time for a pre-Thanksgiving get together with all of the former high school cross-country kids and their parents. The kids literally ate the pie right out of the dish with large spoons. The dish was practically licked clean. It is so good that I made one the next day for Thanksgiving. Yes, we had three cranberry dishes, and they were all yummy. Brined and roasted fresh turkey. This is what our Thanksgiving turkey looked like this year. If you have sharp eyes, you might notice that our fresh turkey came to us with a broken wing. 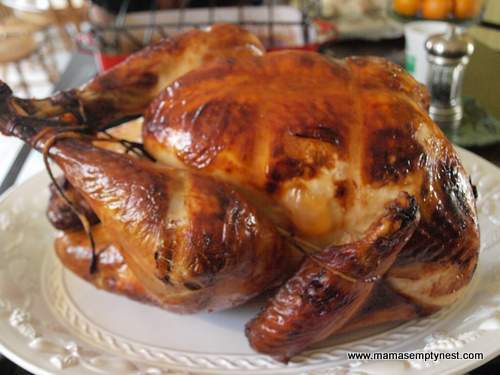 I love turkey and there is nothing better than preparing a fresh turkey. The pre-brined, frozen birds just do not taste the same. I can tell you that this entire turkey was used – every piece of moist meat was eaten, and the carcass was used to make stock and soup. I love turkey, but it is a little bit of work to make it right and to keep it from drying out. So, instead of another turkey for Christmas day, I have been talked into preparing a ham. Since we do more of an open house for Christmas, and we will be traveling afterward, this makes sense. But I am going to miss having a second turkey this year. This entry was posted in Food & Home and tagged Canning & Preserving, Christmas Cookies, Desserts, Holidays, Poultry, Thanksgiving. Bookmark the permalink.